Take control of your day with the uncompromising strength of our 2015 RAM Diesel 2500 SLT Crew Cab 4X4 presented in handsome Bright White. Motivated by a TurboCharged 6.7 Liter Cummins Diesel 6 Cylinder that generates 350hp while paired with a 6 Speed Automatic transmission for amazing pulling capability. This Four Wheel Drive comes with heavy-duty suspension, you are rewarded with colossal payload and towing capability while still scoring near 18mpg on the highway while shining bright with prominent XD Series wheels, running boards, and chrome trim. Inside the comfortable SLT cabin, you will see a practical set-up with a durable seating bench. Flip the center seat-back forward and you have your own storage area or work station to simplify your busy life. In addition to the comfortable seating, you have a touchscreen audio interface, Bluetooth, available satellite radio, USB/iPod integration, plus an auxiliary jack. Easy to use controls, keyless entry, full power accessories, a power sliding rear window, and power heated mirrors are included for your added convenience. 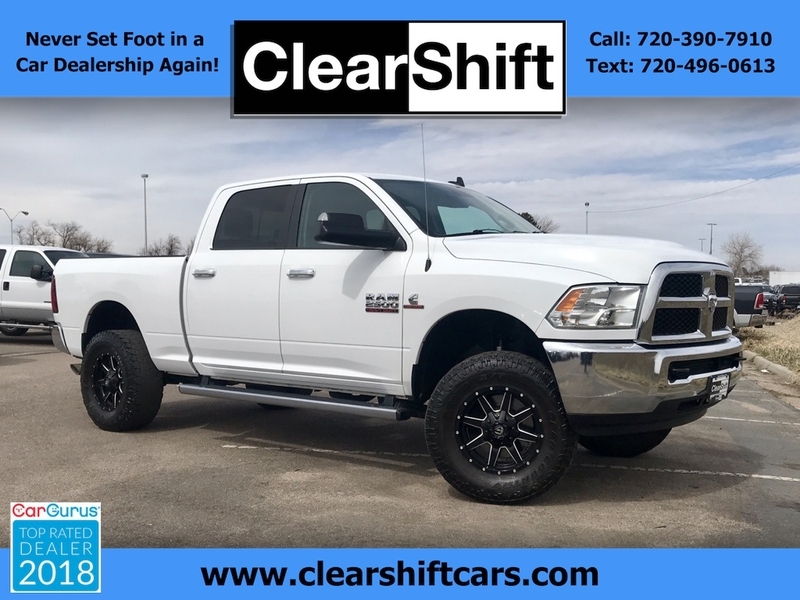 Our RAM offers anti-lock brakes, front seat and side curtain airbags, stability and traction control, and a tire-pressure monitoring system that are all included to keep you safe and secure as you go about your routine in this 2500 SLT. See what it can do for you! Print this page and call us Now... We Know You Will Enjoy Your Test Drive Towards Ownership!